Describe in one word the taste of our food products – this is the primary request of the person who invited us to attend an event that presents many dishes from different restaurants in Cavite province. I gave a hint to let me savor it first, and give my comments later, but the tantalizing smell and innovative presentation of each menu prodded me to say a word – inviting. For a deeper meaning of what I said - it’s enticing! By the time I tasted the first entrée, other guests were already treated with Cavite Express of Cavite Republic Restaurant. So I headed to their table for another scoop of delicious dish that is made of creamy coconut milk with savory taste of chilli and seafood. In my early days of blogging, the same restaurant invited us for a food tasting activity that allowed us to appreciate the marriage of delectable cuisine and history. After all, the province of Cavite is a historic location, right? But my favorite snack from Cavite Republic Restaurant is Lihim ni Lola, because it’s mystifying and tasty. Have you experienced eating a delicacy that’s one-of-a-kind? It’s very inspiring, I must say. I was enamored with Pansit Negra of Chefoo Restaurant for I love eating seafood, especially pusit. The color isn’t cool, I know, but the taste is definitely delicious. No wonder the dish has been featured in television shows so many times. 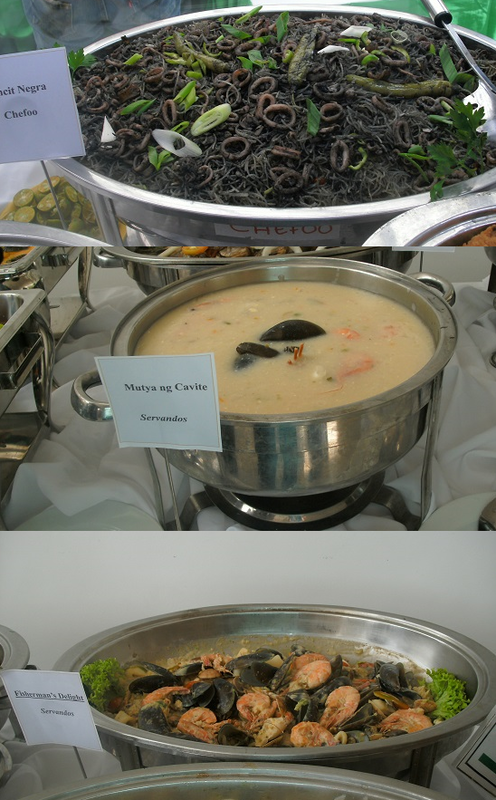 But if you are craving for a creamy seafood soup meal, the Mutya ng Cavite of Servandos Restaurant is for you. It’s splattered with tasty seashells and other seafood delight. The longganisa from Imus was appetizing. It was well-prepared, too. I also tried eating the Grilled Pork Spareribs, because I really like grilled pork with an appetizing sauce and side dish. All other dishes are delicious. The food invasion adventure has captured my attention – especially in fine dining and diverse cuisine. And since I still have to visit again the participating restaurants of the said event, I’m craving for more servings of food products from Cavite, especially signature dishes that marked its popularity in the food industry. Indeed, it was an adventure. It was a food trip that’s unforgettable. Aside from tasting the delectable meals, I get to know other people and enjoy a visit in The Dining Room at The Gourmet Farms in Silang, Cavite. I wonder if it's possible for my family and friends to hold the same activity in a popular dining place and just enjoy a road trip in going there. After all, rent a car Philippines service is popular nowadays. Do you have a memorable experience in dining at a Cavite restaurant? Let me know in the comments section.